Looking to catch some opening day action, but aren't in front of the TV? 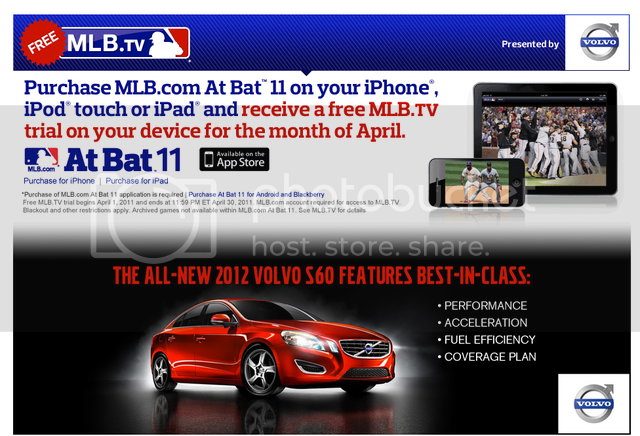 Volvo is celebrating opening day by partnering up with MLB to provide a free MLB.TV trial for the entire month of April. Fans can sample MLB.com's At Bat 11 on all Apple iOS mobile devices. The game tracking app features live streaming of regular-season games on with access to MLB.TV on android and a redesigned MLB.com Gameday experience with realistic ballpark images for iPad. "We're delighted with the fans' response to our best release yet, At Bat 11," said Dinn Mann, EVP Content, MLB.com. "The At Bat 11 app's features optimize the presentation of baseball on any mobile device, making it convenient to watch or listen to live games." After downloading the app, fans will receive the first month of service for free courtesy of Volvo.